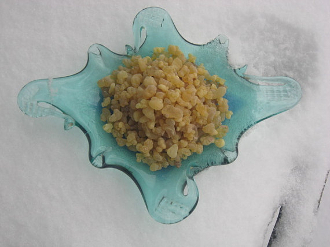 Frankincense has had spiritual significance since ancient times and was also adopted as medicine for physical ailments. The resin is best known through the story of the Three Wise Men (Magi) delivering gold, frankincense, and myrrh for the infant Jesus. These resins, valued like gold, were mentioned repeatedly in the Old Testament, in instructions to Moses about making incense and anointing oil, and in the Song of Solomon. Frankincense is an aromatic resin collected from Boswellia trees. It has been traded on the Arabian Peninsula and in North Africa for more than 5000 years. Frankincense was found in the tomb of the ancient Egyptian King Tutankhamen, who died in 1323 BC. Pure resins are what started it all and are what every other incense is modeled after now, only they use synthetic perfumes to mimic the original resins due to cost. Resin incense is to be used on charcoal briquettes, it does not self ignite due to not containing any salt petre or any other flammable chemicals as sticks and cones do. Frankincense has a pungent citrus, tart, smokey scent and is THE incense for exorcising, fumigating, cleansing and consecrating. Prefect for circle casting and preparing for ritual! Add to charm bags too for protection! You will receive 1 ounce if incense WITH 2 charcoals to get you started! The first two pictures show the actual resin you will be receiving.